If your blog or website has broken links, that can hurt its search rank. Search Engines do not like websites and blogs with a lot of broken links because Search Engine spiders often get not found the result when they crawl websites with them. That prevent spiders from crawling them smoothly. Broken links occur when someone mentions a page that does not exist or removed. In Blogger, you can easily fix the broken link issues. To learn how to stop showing page not found when someone comes to your Blogspot site by clicking a link to the non-existing page and show a proper custom page to redirect the visitor. 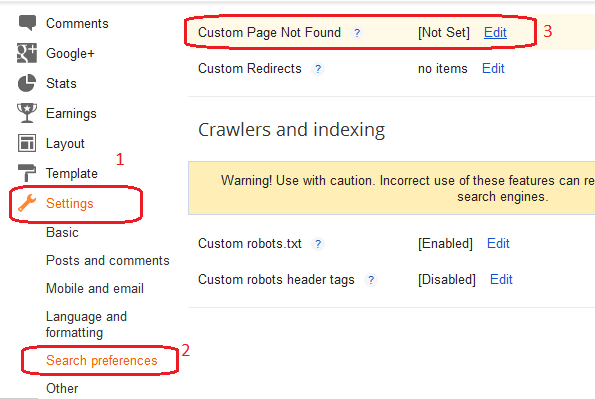 We can create a Custom Page Not Found to display when a visitor comes to your blogger blog by clicking a broken link. Now click on edit button near "Custom Page Not Found "
Here you can set a custom message or redirect for visitors who followed a broken URL. Now onwards any visitor comes to your Blogspot site by following a broken link will be redirected to the custom page instead of the post not found. You can add some of the popular page links on the custom page to retain the visitors. If you want to learn how to remove digits from blogger URL, follow the steps mentioned in the link below. In this tutorial, you have learned steps to deal with broken links in a blogger blog. However, these steps are not enough to redirect a visitor comes by following a link that was removed or modified to a specific post. To do that follow the steps mentioned in the link below. If you add a custom domain name for your Blogspot blog, if something goes wrong, all the visits to your blog following the old URLs will be shown blog not found. So if you are planning to use a custom domain name for your blogger blog, to avoid page not found issues, you must do it correctly. To learn this visit the link below. A good post. Keep writing more..